La Vencedora, by Ivory James, was the fastest qualifier on the second night of trials for the $1,320,400 Remington Park Futurity (RG3). WAYNE, OK�APRIL 8, 2017�Multiple stakes sire IVORY JAMES had another big night of racing Saturday getting finalists in both the $1,320,400 Remington Park Futurity (RG2) and the $483,600 Sam Houston Futurity(G2). La Vencedora, a $12,000 Heritage Place Yearling Sale graduate, posted the fastest qualifying time from day-2 of the Remington Park Futurity(RG2) trials in Oklahoma City. Ridden by jockey James Flores the brown filly drew off impressively in the fifth trial to win by 2 � lengths. Her time of :17.011 the fastest clocking from 12 trial races contested Saturday night. Gerry McLean conditions the IVORY JAMES filly for owner Terry McLean. Bobby D. Cox bred La Vencedora in Oklahoma from the Mr Jess Perry mare Jess Shakem. She finished third in maiden race on March 23rd. For the complete list of Remington Park Futurity(RG2) qualifiers from both nights of trials with their times, sires, dams, owners, breeders, trainers and jockeys CLICK HERE. 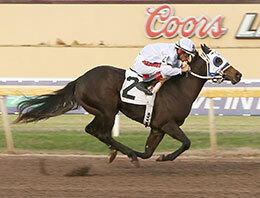 The rich final will run back on Saturday, April 22nd at Remington Park in Oklahoma City. Also on Saturday night, Nocturnes posted a nose win in the seventh trial for the $468,600 Sam Houston Futurity(G2) to get the second fastest qualifying time of :16.977 seconds. Jockey Francisco Calderon rode the TQHA Yearling graduate for owner Agustin Hernandez is trainer Angel Sanchez. Bobby D. Cox bred the IVORY JAMES colt in Texas from the One Famous Eagle mare Corazonase. He brought a final bid of $18,000 from Hernandez last summer. Nocturnes will join IVORY JAMES' Capital Ice who won a shake on Friday night to secure a starting spot in the Sam Houston Futurity(G2). Ridden by Jose Martinez, the�IVORY JAMES colt finished second in the fourth of nine trials on Friday while recording a :16.984 clocking to get the fifth fastest time. Angel Sanchez trains the gelding for owner Jody Garcia. Womack/Cavender Farms bred Capital Ice in Texas from the Mr Eye Opener mare a Fantastic Six. He is a half-brother to Remington Park Juvenile runner-up Days Gone Down. The finals will be held Saturday, April 29th at Sam Houston Race Park.